Undoubtedly, emotional relationships, as a description of the emotional bond between any two individuals or between an individual and an animal or an object, are one of the most challenging ontogenetic and developmental tasks. 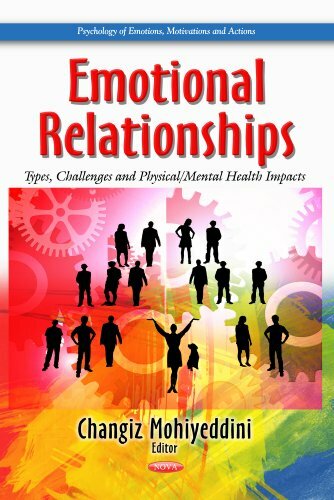 Hence, the main purpose of the present edition is to discuss crucial issues related to emotional relationships. The initial chapter provides the reader with a brief introduction into key aspects of emotions that delineate their high degree of importance to humans and their wide range of functions as a highly complex phenomenon. As emotions can be over powering and become debilitating and intrusive in daily life, thus, the ability to effectively regulate emotions is paramount as it serves as a protective factor against emotional distress. Considering the fact that emotions have a crucial impact on all levels of our work life, Chapter Seven focuses on managing emotions in the workplace, followed by a review on emotional intelligence (Chapter Eight) that recognises the individual differences in processing and managing emotions in everyday life. Chapter Nine reviews the growing interest in utilising human-animal relationships for enhancing physical and emotional well-being. Wolf and Brown explore the nature of the life-enhancing relationship between humans and animals and describes the Animal Assisted Play Therapy Program as one illustration of how the human-animal bond may facilitate well-being and can be the foundation for building other relationships.